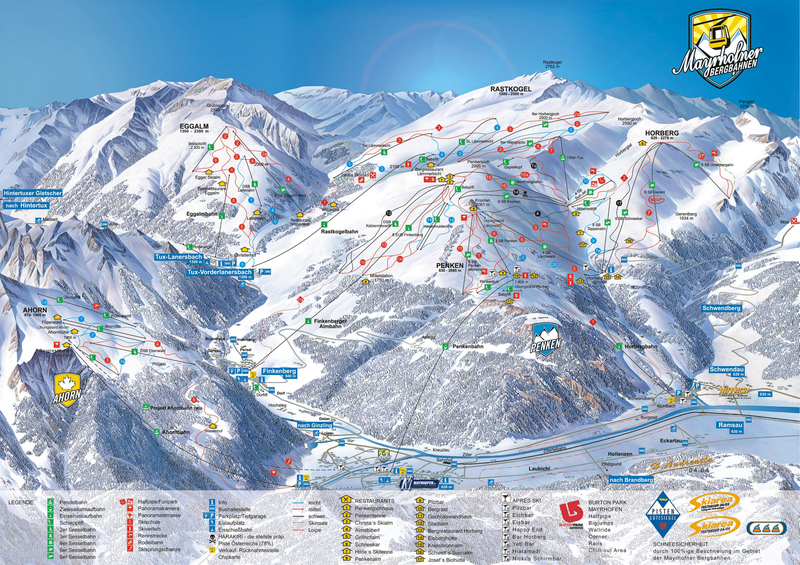 Mayrhofen is very popular with the package holiday companies and their clientele. It has a great variety of runs and a pumping nightlife, but it is not particularly high so snow conditions can be patchy late in the season even with the many snow cannons. However further up the valley is the snow-sure glacier at Hintertux (which is open all year round). The Penkenbahn can get long queues at peak times so it may be worthwhile taking a ski bus to take a lift at Finkenberg. Trains from Innsbruck take around a half hour to get to Jenbach where you switch to the Zillertalbahn. Trains from Jenbach usually run twice an hour and take a scenic hour to get to Mayrhofen. The station is less than a kilometre from the Penkenbahn, but if you don't want to walk the free ski bus in Mayrhofen takes you from the railway station to the bottom stations for the Penken, the Penkenbahn and the Horbergbahn, and also to a small ski area served by the Ahornbahn. One of the steepest runs in the world is the appropriately named HariKari, although the resort on the whole is characterised by rather more gentle slopes. For lunch you could try the renowned Schneekarhütte (+43 528 564940), at the top of Horberg in the Zillertal sector. The Ice Bar is a mandatory drinking hole after a day on the slopes. A night out in the resort might then take you to the Scotland Yard pub before you round off your night dancing in Arena. Sporthotel Strass and the Hotel Strass, Mayrhofen (4*) Right next to gondola, family-run. Hotel Neuhaus , Mayrhofen (4*) 10 minutes to gondola and good for apres-ski and family activities. Did you ski Mayrhofen or snowboard in Mayrhofen? What did you think? Have you taken the train to Mayrhofen? Do you have any tips on accommodation in Mayrhofen or the apres ski? Is there anywhere else you have taken the train to ski? if so, please contact us and share you experiences using the contact link at the foot of the page.